There are two kinds of people in this world: those who obsess about skincare and those who don’t. The latter views skincare as simply another part of their hygiene routine. Like brushing their teeth, they might not enjoy it, but it has to be done. Skincare addicts, on the other hand, recognize that taking care of your skin isn’t just a hobby, it’s a way of life. Sure, we might spend an entire paycheck on serum and yeah, maybe our nightly skincare routines do take 45 minutes (can we live?). No one said the journey to being more attractive was easy, folks. 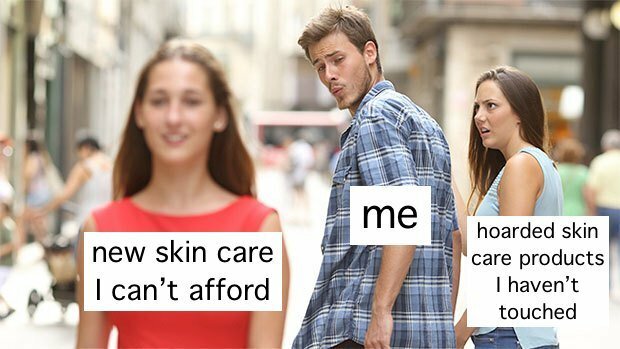 If you have invested too much of your hard-earned money and sanity into your skincare routine, these memes are for you. Everyone already knows that the world is callous and filled with chaos and destruction. Just turn on the nightly news and watch George Orwell’s 1984 play out in real time. Sure, things are always terrifying, but does that mean we should abandon our skincare routines? Absolutely not. Instead of worrying about the state of the world, go on, and invest some time into something that you know you can control: your skincare destiny. A wise person once said, “You have to risk it to get the biscuit.” But is that really true? So what if you nailed the look you were going for after spending an hour and a half watching multiple detailed YouTube tutorials? The party is over now and all you’re left with is clogged pores and angry skin and no biscuits in sight. This is a good reminder to invest in a nice robe, a lifetime supply of sheet masks, and to never leave your house. It doesn’t matter if we’re best friends. It doesn’t matter if we’re family. It doesn’t even matter if you’re Beyonce. If I’ve double cleansed my skin, misted my face with rosewater toner, patted in my anti-aging serum, and applied my La Mer moisturizer, under no circumstances are you allowed to ask me “what are you doing tonight?” — ESPECIALLY if it’s 11:57 p.m.
You know that I’ve gone through my nightly skincare routine and am no longer accepting invites to hang out, I’m only accepting compliments via text. My skincare routine is like an onion. It has layers. It’s a complex process that I’ve spent years and many paychecks fine-tuning. So if you think that when I’m three margaritas deep I won’t hop on the figurative soapbox in the women’s bathroom and detail its steps, you are mistaken, my friend. Sure, no one may have asked what my multi-step skincare routine is, but deep down, I know they want to know. First of all, this meme is extremely rude. Second of all, it’s accurate. I’m here to admit that, yeah, maybe I do spend the majority of my paycheck on luxury skincare items I can’t afford, even though I have literal tubs full of unused products. Sue me. At least I am self-aware. The skincare life chose me and it’s not my fault that Sephora was having a sale and Into the Gloss published their Best of 2018 list on the same day. One of the most traumatic moments of my life was when I watched my boyfriend wash his face with a “3-in-1 cleanser” meant for your “face, body, and hair.” Can… you… even… imagine? The answer should be no. There is no way that a single soap can be effective from head to toe, yet the beauty industry tells men they can get away with it and somehow, men do. Admittedly, my boyfriend has amazing skin, but I refuse to try out his skincare routine because 3-in-1 anything makes me shudder. Anyone who has dealt with acne-prone skin knows the incredible feeling of validation that hits when your skin clears up. You stop and think, ah, yes, my expensive, multi-step skincare routine is working! I’m basically a dermatologist! Then you wake up to a giant pimple on your face and realize your acne was never under control and that the universe is callous and filled with chaos and destruction. Don’t worry, this is just how the universe keeps us humble. Is This Not a Light Layer? We all know what a reasonable amount of product is. But when it comes to applying creams, serums, moisturizers, you name it, it’s hard to resist layering the goodness on your skin. Using more of a product doesn’t mean it will make it work better or faster, but we can pretend. My advice? Don’t listen to the haters. Go on and apply not one, not two, but 10 layers of your moisturizer. These fools won’t be laughing when you’re living your best, most moisturized life. In full transparency, I got a C in high school chemistry. Little did I know that I would grow up to be a real live chemist. Well, sort of (OK, not really at all). A girl can dream though, and for all intents and purposes, my multi-step skincare routine basically means I have the same credentials as a chemist…or at least someone on Grey’s Anatomy. In all seriousness, if schools used skincare products as tools in chemistry class, maybe students’ grade would be higher. Give the people what they want: glowing skin. First of all, I already know it’s time for me to be using a night serum (and I do, thank you very much). Second of all, do not disrespect these iconic shoes which were a ’90s staple that should have withstood the test of time (also, R.I.P. Delia’s). Now that we’re on the topic, if you owned these shoes and you don’t yet use a night serum, well… get on it. When I was in my early twenties, there was nothing I wanted more than to return from vacation with a deep, glowing tan. We all look better and healthier with a little glow, but let’s face it — the sun isn’t doing our skin any favors in the long run. When I look back on my youth (R.I.P), I think of all those trips to the beach sans sunscreen and shudder at the thought. Today, I’ll still gladly take the tropical vacay, but please pass me the SPF, I’ve got wrinkles and sunspots to fight off. Remember when I mentioned that I was traumatized after my boyfriend washed his face with a 3-in-1 cleanser? Well, everything came full circle when he later asked me the question above. Do I have any ideas to help you with your skincare? Um, hello, hi, yes, how long do you have? Boy, we’re going to hook you up with a proper cleanser, an exfoliant, some toner, and a solid moisturizer if it’s the last thing I do. This is triggering, to be honest. No matter how seriously I take my skincare routine, every now and then I slip up. Prodding at your pores is the slipperiest slope of them all. You see a tiny blemish on your chin, so you poke it ever so gently. You’re just performing an extraction as your dermatologist would do, right? RIGHT? WRONG. Next thing you know, you’ve moved from your chin up to your cheeks and your forehead and you straight up look like a Ghirardelli peppermint candy. The worst part of all is that you did this to yourself. If you’re not familiar, Mario Badescu is a facialist from Romania who founded his own skincare line in 1967. The products, like the above facial spray, adorn the shelves at Urban Outfitters and have a cult following these days. The rosewater facial spray, in particular, is beloved since it can reduce redness, moisturize the skin, and help breakouts. But apparently, it can also cause a breakup. If he doesn’t respect you on your skincare quest, dump him, girl. As I’ve said, skincare isn’t a choice, it’s a way of life. When you feel as deeply about skincare as I do, it takes priority over other things in your life. Sometimes, those things include your other organs. Listen, in a perfect world I drink a gallon of water every day and only eat organic superfood salads. But I’m not Gwyneth Paltrow, so for now, if I can only take care of one organ, it’s going to be the largest one I have. The world may be crumbling, your bank account may be in the single digits, your credit score may be poor, and your love life in shambles, but if you apply an elaborate skincare routine then congratulations, your life is in order. The path to success is not a straight line so who is to say that achieving the glowing skin you so deeply deserve isn’t step one? Live your truth, my friends. If you ever want to be humbled, please head to the nearest Steak & Shake or other business with atrocious lighting and get ready to cry while plotting how you are going to overhaul your entire skincare routine. I just want to say that I have been personally victimized by watching my boyfriend wash his face with hand soap only for him to appear like a glowing prince without pores. Meanwhile, I religiously complete my ten-step Korean skincare routine nightly, and what do I get? Dullness. Redness. Hormonal acne. Cool, cool, cool. It’s safe to say that, as skincare addicts, we can all relate to our face refusing to respect us — but I still refuse to believe in the less-is-more mentality and hand soap will never find its way into my routine. This meme hurts my feelings because, at the end of the day, I know that no matter how much time, energy, and money I invest into my elaborate skincare routine, my skin is STILL going to disrespect me at the time I need it to be on my side the most. My skin truly had a mind of her own and when it comes down to it, I know she’s the boss and I’m just a helpless minion. It’s a tale as old as time. I am impeccably consistent with my skincare routine. I cleanse, I tone, I moisturize. I cut back on sugar and, yes, even alcohol. My skin clears up and suddenly I am a feminine deity, full of confidence. But then I get too confident and the universe decides I need to be humbled. The next thing you know: a breakout stakes its claim on the better portion of my face.